Sharice Davids was a longshot in her campaign against four-term Republican Rep. Kevin Yoder. But ABC News partner FiveThirtyEight forecasts Davids with a five in six chance of turning the seat in a Republican-leaning Kansas City area district blue. 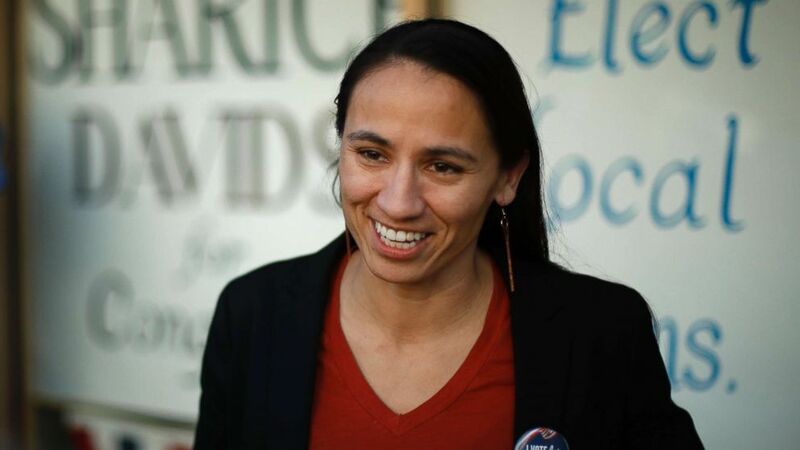 The political newcomer could make history as the first Native American lesbian woman in Congress if she wins. She would also be the second openly lesbian woman in Congress. Davids is from the Ho-Chunk Nation in Wisconsin and has focused her career on the advancement of Native Americans. Alongside New Mexico’s Deb Haaland, she could be a part of the class of the first Native American women in the House. Democratic Congressional candidate Sharice Davids talks to supporters at her campaign office on Oct 22, 2018 in Overland Park, Kan.
After graduating from Cornell Law School, Davids moved back to Kansas City as an attorney working with tribes to create economic development opportunities and initiatives. The former MMA fighter then spent five years on the Pine Ridge Indian Reservation in South Dakota where she ran an economic development program and later served as the deputy director of a nonprofit that helps launch businesses and build housing on the reservation, according to McClatchy. She was hired as a fellow from 2016-2017 by the Obama White House, citing her business experience. On her website, she said that her time there inspired her to run and she’s scored an endorsement from Vice President Joe Biden. She’s staked her campaign in progressive issues and tax, healthcare and education reform are all pillars of her campaign. Her stance on immigration reform became unclear after she said in a July interview that she supported defunding Immigration and Customs Enforcement. She later walked back those statements, telling ABC affiliate KMBC that she does not support abolishing ICE. She clarified that she simply does not support the policies of separating children from their families at the border. She’s also come under fire from her opponent for her lack of presence in the local media and at events, according to KCUR, but that hasn’t seemed to slow her mounting popularity. Davids has raised nearly $2.5 million in donations in the third quarter, outraising Yoder by over $1 million, according to FEC data. The majority of her fundraising comes from large individual contributions. The majority of Yoder’s funding comes from super PACs.